Back in 1973, Hurricane pioneered a new boat concept that would forever change the way many people went boating. Called the FunDeck, it featured a pontoon boat layout atop a fiberglass hull, and over time it led to the development of the modern deckboat. But Hurricane is still building FunDeck models because this ever-evolving design provides plenty of passenger space and has the seaworthiness and quietude of a fiberglass hull. 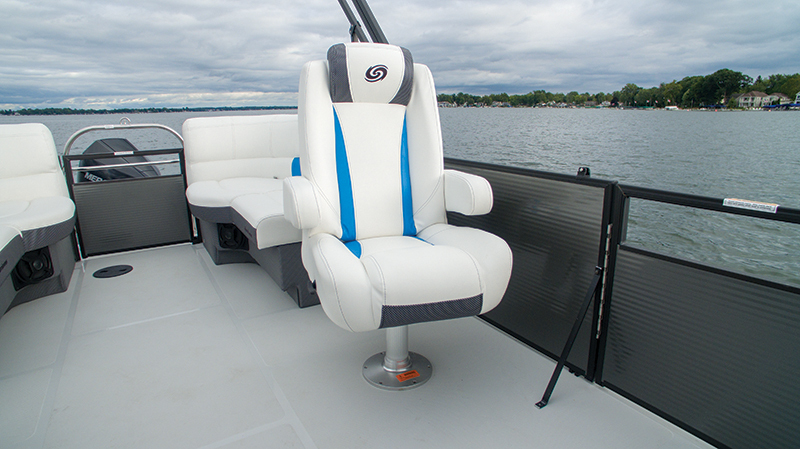 The latest and largest iteration is the FunDeck 236SB OB whose open design and seating configuration can accommodate up to 12 people. The SB stands for Split Bench, a layout that comes with quad layback lounges. 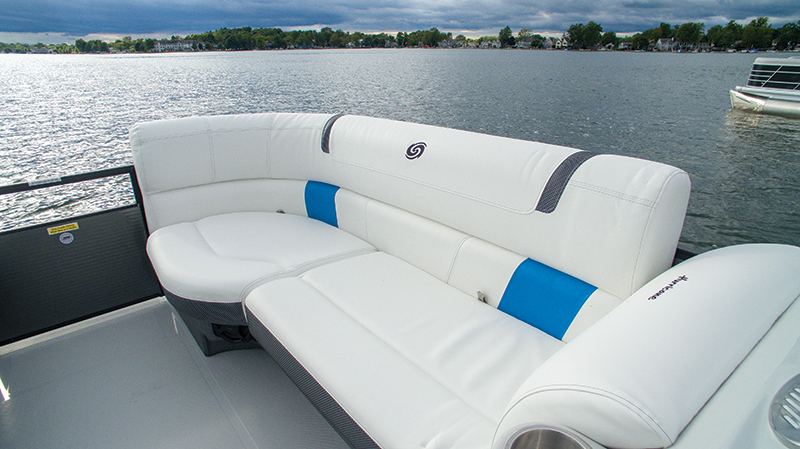 On our test boat, the lounges — upgraded to the Sport Luxury vinyl package — were white with Vapor Blue accents. The optional changing room enclosure ($367), which resides in the front portion of the portside stern lounge, can house a portable toilet ($167). The 236SB’s fiberglass cathedral hull has a moderate 13 degrees of deadrise, giving it plenty of lift out of the hole and helping it ride high in the water, with just enough Vee to help it part the waves. Powered by a new-generation Mercury FourStroke 200, it reached plane in 2.6 seconds with very little bowrise, galloped to 30 mph in 6.2 seconds and topped out at 41.3 mph. An advantage of fiberglass is it doesn’t have any corrosion issues, which makes it really popular in saltwater coastal areas. 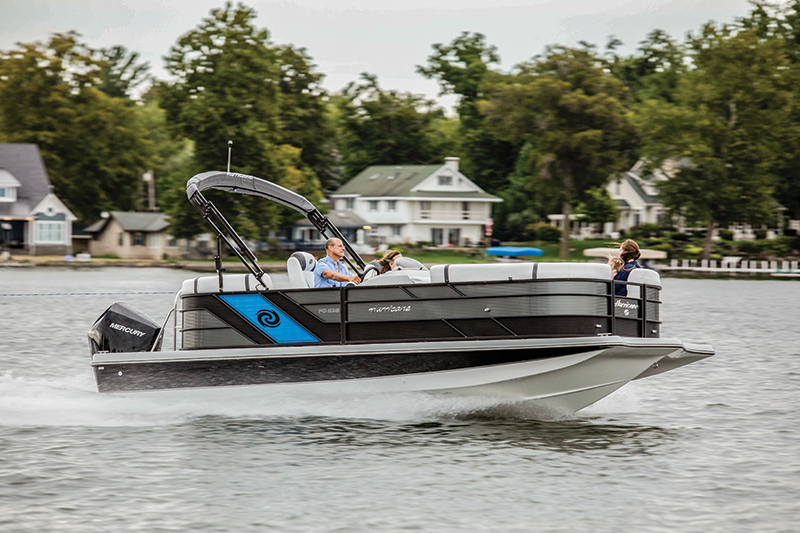 Sometimes pontoons can rattle in choppy water, but during our test, the 236SB felt very solid and was quiet, even at higher speeds. Coastal boaters will like the standard fiberglass deck, which can be easily cleaned at the end of the day. Snap-in carpeting is standard and snap-in vinyl flooring is available for $960. 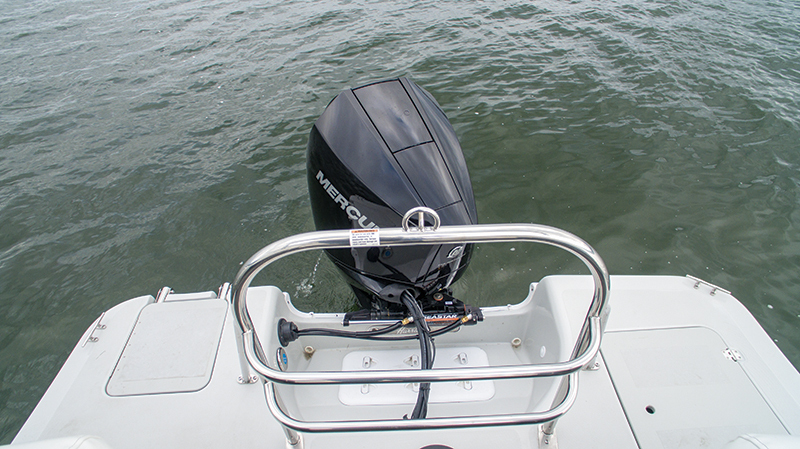 The 236SB is ready for watersports with a sturdy, fixed ski tow cage on the roomy swim platform. There is room in front of it to wedge a towable tube during transit to a favored tubing place, so you don’t have to inflate it onsite or have it eat up cockpit space. 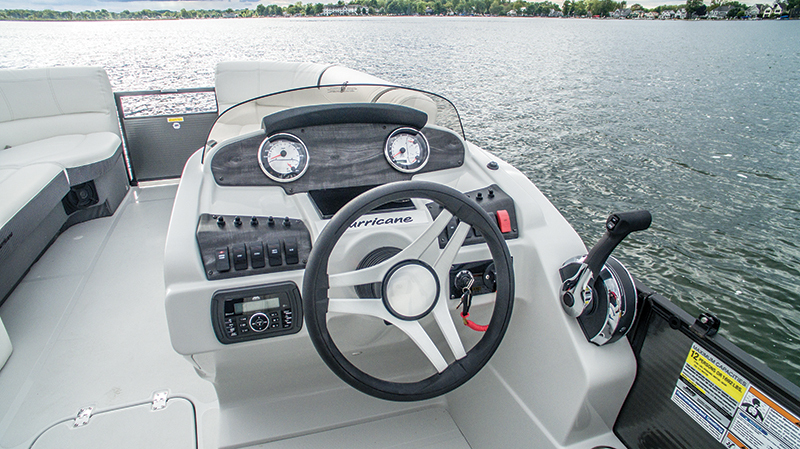 When the day’s action is done, tubes — even gigantic ones — can be deflated and stowed in the thigh-deep, 80-inch-long centerline storage compartment that’s a standard feature. Time to Plane: 2.6 sec. Time to 30 mph: 6.2 sec.